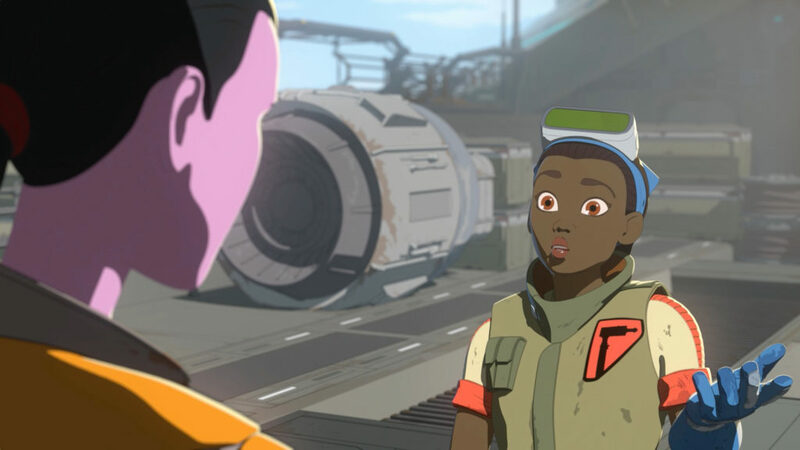 We’ve reached a third of the way into the first season of Star Wars Resistance, and the animated show finally has passed the Bechdel Test. Over two decades after the test’s creation, passing it shouldn’t be viewed as an achievement, but rather as a minimum expectation. By way of contrast, She-Ra and the Princesses of Power passes the test multiple times each episode. That Resistance has taken so long to reach this point reflects broader problems with the portrayals of its female characters, who are steeped in tropes and consistently sidelined in favor of the male characters. The intention behind the test is to examine at a fundamental level if a story defines its female characters with motivation and goals that don’t revolve solely around their male counterparts. Passing the Bechdel Test doesn’t necessarily mean the characters will be well fleshed out or that the story is progressive. In fact, plenty of problematic stories pass the Bechdel Test. On the other hand, if women are represented equitably by fully developed characters, passing the test should happen easily. Remarkably for as expansive as Star Wars is, it still struggles on this metric across all film and television. 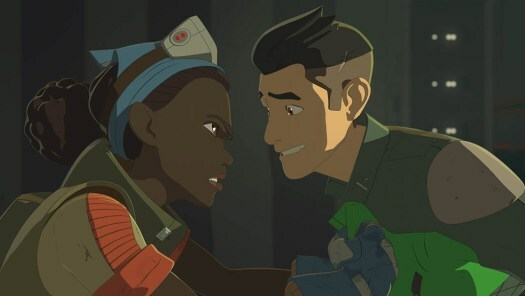 The preview clip for the eighth episode of Resistance, “Synara’s Score,” involved a scene with Synara and Tam that achieves what the test is looking for: two women talking, and for at least one of them revealing to the audience a driving motivation in her character. The full episode included additional conversations between the women, so fortunately the preview clip was not the only scene in the episode that passed the test. Yet as a whole, the episode reinforced many of the problematic aspects of Resistance’s female characters, who – with one exception – have been written and directed by men. In the previous seven episodes we’ve seen brief peeks at Tam Ryvora, but they are moments dropped in amid Kaz’s adventure. She relates in the series premiere that the Fireball racer had been promised to her when she completes its repairs – and then it is promptly handed to the male protagonist, who just showed up on the Colossus and has no idea how the racing competition even works. This is a classic example of the problematic theme, seen across storytelling, that elevates men’s objectives and desires over women’s. Unfortunately, Tam’s reaction to this affront plays into the longstanding trope, in both fiction and real life, of the angry black woman. What might be interpreted as righteous indignation from a white woman instead is dismissed as petty and uncontrolled (or uncontrollable) anger – even when it comes from an iconic world champion like Serena Williams. In Resistance, Tam is repeatedly written as the angry or defensive character against Kaz’s bumbling charm. It’s troubling to see a Star Wars show lean persistently into harmful tropes. 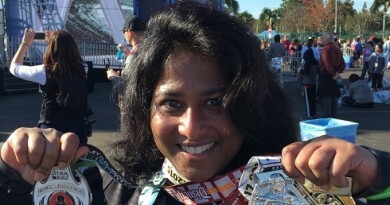 We’ve seen even less of Torra Doza, another woman of color who has been portrayed with a pastiche of tropes rather than with motivation and depth. While the character is voiced by Latina actress Myrna Velasco, her appearance and home – as shown in the fifth episode, “The High Tower” – draw upon an Asian aesthetic. 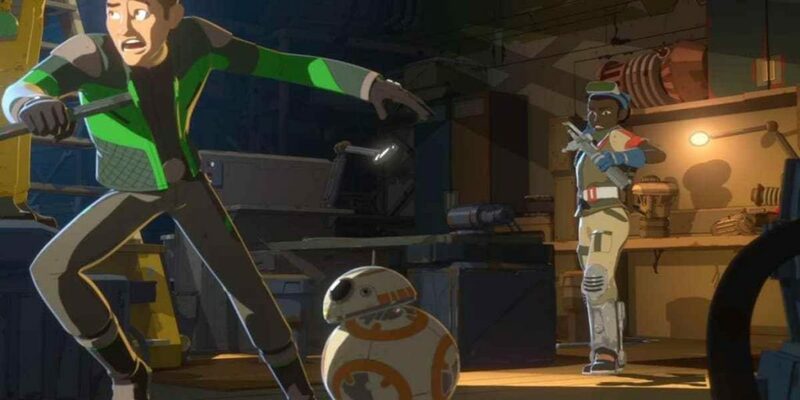 It’s not surprising to see Asian influences in the visuals given that Star Wars Resistance is an anime-stylized show and George Lucas relied on significant cultural appropriation from Asian cultures during the Prequel Trilogy, especially for Naboo. Torra hasn’t been in enough of the show to determine if she ultimately will embody a particular trope; so far she varies between the Dragon Lady and Lotus Flower tropes. The Dragon Lady appears in Kaz’s first encounter with Torra. Her room, with its array of toys that suggests she is immature or childlike, presents another prevalent stereotypical representation of Asian women, one that goes hand in hand with a Western male tendency to fetishize them as well. Beyond the racial stereotypes, Torra’s characterization to date is little more than a Manic Pixie Dream Girl to catch Kaz’s fancy. While I initially wondered if the show was erecting Mystery Boxes around Tam and Torra in order to pay off reveals further into the first season, it is only in the eighth episode that we finally get a brief exchange of dialogue that parts the curtain on Tam’s motivations. From episode titles and blurbs, it appears we may extend past the halfway point before learning more about Torra. Last week’s episode, “Signal From Sector Six,” introduced pirate Synara San in a manner that continued the stifling portrayal of female characters. Beyond the simple math that women are completely outnumbered in the show, with one female character to every four male characters, they are not given nearly as many lines when they do speak, and more often than not their dialogue is expositional or receptive and not experiential, another way that women are repeatedly undermined in screenwriting. Enter Synara, who participated in the pirate raid in “The Triple Dark.” The fact that she is a pirate isn’t a mystery, and by the time the episode ends her role on the Colossus is laid out for the audience. 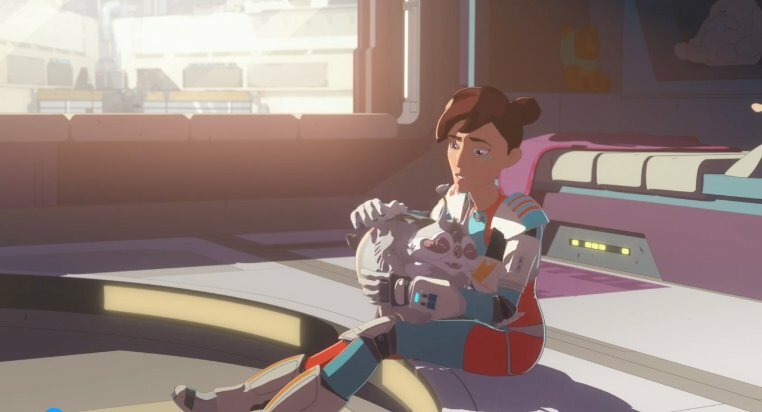 There is no functional reason to keep her unconscious and silent when Poe and Kaz rescue her, except that the story wants to give more time to the two men. Awake and acting as an active participant in the escape from the freighter, Synara would have been allowed time to show her capability and competence, perhaps even voice some motivations. Maybe the Kowakian monkey lizard hijinks were funny, but imagine how A New Hope‘s Death Star escape scene changes if Leia is unconscious. That brings us to this week’s new episode, “Synara’s Score,” which gave Tam and Synara more screen time than women have had previously, although the main focus and driver of the story remains Kaz. The sideplot with Tam and Synara merely punctuates Yeager and Kaz battling with the pirates to get the tracking system online. What struck me most about this storyline was that Tam is clearly the most skilled character, given all we know about her and everything that we see earlier in the same episode, to be able to get the installation done fast and accurately. Tam abandoning her post – in a situation where Yeager states the obvious, that the tracker has to be installed or they will be helping no one – is out of character for her, and simply a plot device cooked up to showcase Kaz in the fight with the pirates to carry out the installation. Similarly, in the early episodes Tam is portrayed as cautious and wary, deeply skeptical of Kaz when he first arrives. Yet she immediately trusts Synara after she quickly provides the necessary component – even though it is apparent to Yeager at the end of the previous episode that Synara cannot be readily trusted. Prior to this episode, Tam is consistently portrayed as wiser and more competent than Kaz, yet in “Synara’s Score” she makes foolish choices to enable Kaz to be centered in the action plotline. Ultimately, the plot device of the entire episode is the Idiot Ball, which is handed around from character to character in order achieve the desired outcome of the story. By all means, any particular character is entitled to the Idiot Ball at one point or another – we’re all capable of stupid mistakes – but when every character holds it over the course of an episode, it is time to take a look at the internal logic of the writing. What is also noteworthy about “Synara’s Score” is that when two female characters are given more screen time than previously, the writers/directors included no other women in the story, except for brief glimpses in the background. Every other speaking character is male, bringing the ratio in this episode down to one woman to seven men. 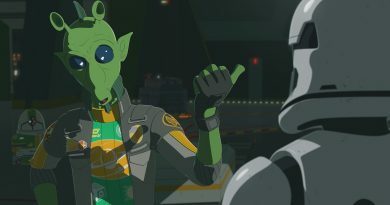 Even a passing mention of a parent by Tam is her father, which adds another father-child dynamic into the show; mothers are absent from Star Wars Resistance. Although there may be some queer coding in “Synara’s Score,” the Star Wars franchise has a poor track record in that regard, and one has to question how committed the show is to it when the powers that be continue to sideline inclusion in key creative positions. With every passing show, more men than women are dropped into or expanded upon in the galaxy far far away. The gender gap behind the camera and on screen is widening in Star Wars.